August 2018. 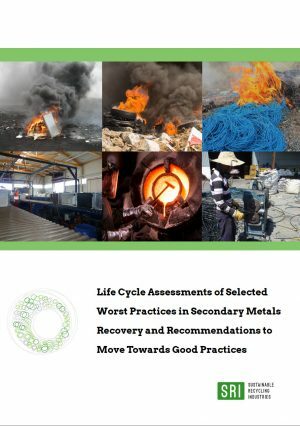 The publication on ‘Life Cycle Assessments (LCAs) of Selected Worst Practices in Secondary Metals Recovery’ presents a unique work developed by Ecoinvent and the World Resources Forum (WRF) under the Sustainable Recycling Industries (SRI) Programme. The report sheds lights on the severe environmental impacts of the selected worst practices and identifies, quantifies and presents their environmental impacts based on Life Cycle Assessments. This report describes the methodology employed and the assumptions taken to estimate the life cycle impacts of the ‘worst practices’ selected. Afterwards, results and hotspots are discussed and alternative ‘good practices’ presented.